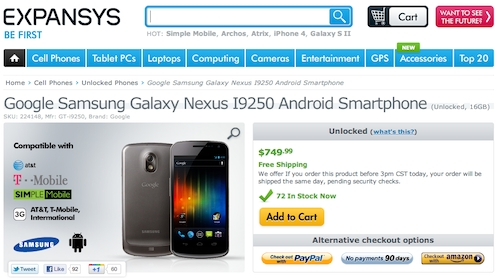 Unlocked Galaxy Nexus available from Expansys for $750 | Android Blast! If you're in the market for the latest greatest Android phone you can pick up the Samsung Galaxy Nexus from Expansys. Engadget has confirmed that the Galaxy Nexus is now shipping in America from Expansys so you don't have to pre-order anymore. The unlocked version will set you back $750.